Eurostar has told passengers only to travel from Paris to London “if absolutely necessary”. 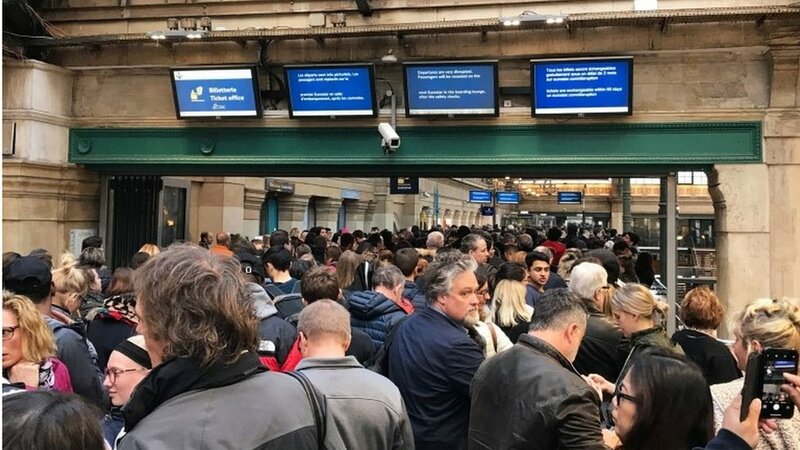 Its services have been hit by serious delays, as long queues have formed due to industrial action by French customs officers. Four trains were cancelled on Sunday and another three will not run on Monday. The company says tickets can be changed free of charge, or refunds can be claimed. “We recommend not to travel unless absolutely necessary, ” Eurostar advised passengers on its website. Passengers have been complaining on social media of long queues in Paris. Catherine Hope tweeted that it had taken her four-and-a-half hours to clear all the queues. Another passenger said they had waited two-and-a-half hours. Eurostar says the delays are averaging at two hours and they expect similar delays on Monday.